Source: Delta Industries, Jackson, Miss. 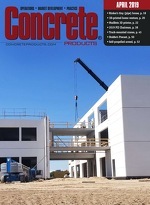 Delta Industries, with 30-plus ready mixed plants in Mississippi, Alabama, Louisiana and Tennessee, has outlined a May 1 transition plan for retiring President and Chief Executive Officer Dave Robison, naming as his successor Executive Vice President and Chief Operating Officer J. Thomas Evans, Jr.
ACI elected its 2019-2020 officer slate during the Concrete Convention and Exposition late last month in Quebec City: President, Randall Poston, senior principal with Austin-based Pivot Engineers; Senior Vice President, Jeffrey Coleman; and, Vice President, Cary Kopczynski, senior principal of Cary Kopczynski & Co., a structural engineer with offices in San Francisco, Los Angeles, Seattle and Chicago. Oldcastle APG has acquired Virginia’s Allied Concrete Products, an established player in hardscapes under the Eagle Bay brand, and concrete masonry and lightweight aggregates supplier in the Richmond/Tidewater region. Chaney Enterprises has closed on Maryland ready mixed producer PCS Concrete, welcoming founder Tom Pittman to its executive management team as maintenance operations officer, and naming Sharon Carr Pittman as technical service project manager. PCS has a payroll of 40 and operates in Annapolis Junction (headquarters), Westport (Southern Baltimore City), Owings, Waldorf, and Sparrows Point (Baltimore County).